Lovely lustre to mother of pearl. Summary. 925 STERLING SILVER. See photographs. Signs of age & wear. Stamped & Hallmarked. Mixed job lot of Cuff Links. Circular Blue Cufflinks Mother Of Pearl Light Blue Hint Round Wedding Cuff Links sent in a velvet bag. VINTAGE EDWARDIAN/DECO CREAM SHADES MOTHER OF PEARL & GILT CUFFLINKS An opportunity to bid on a pair of decorative Edwardian/Deco cufflinks set in gold colour metal (gilt) with cream/white shades mother of pearl. 'GILT' is impressed on both fronts & backs. They have chain link fittings. The mother of pearl shows hints of wonderful vintage colours. Please see photo's as they form part of the description. Some wear to the metal on the backs - they are approximately 100 years old - good wearable condition though. Approximate diameters of the fronts are just over 0.5" (1.27cm). These are sold as seen in photo's. Display boxes are not included. 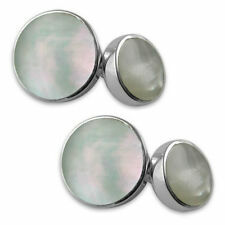 New/Boxed - JASPER CONRAN Mother of Pearl CUFFLINKS Semi Precious Stones. In perfect new condition - From a smoke/pet free home. Payment by PayPal only please - Postage within the UK ONLY. Thank you for looking. The head on these are 1.5 x 1.2 cms big and they are on gold tone snap backs. Mother of Pearl Cufflinks, Oval shape, Gold plated. The cufflinks are presented in a black velvet drawstring pouch. 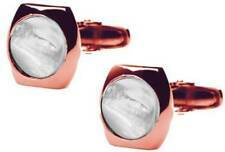 Oval-shaped gold-plated Cufflinks with Mother of Pearl Superior stone. Cufflinks are gold plated. Would be a perfect gift for any gentleman who loves to wear cufflinks. Antique / vintage mother of pearl cufflinks stud jewellery job lot. Age related wear & tear, please see all pictures before placing any bids. 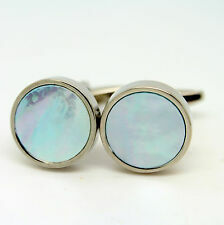 Vintage Mother Of Pearl Cufflinks . Condition is Used. Lovely condition for their age . nice and chunky and a good size measuring 1.5cm square for the main piece . Dispatched with Royal Mail 2nd Class. The cuff links will be gold plate or tone but NOT made out of gold. The cuff links look nice on. 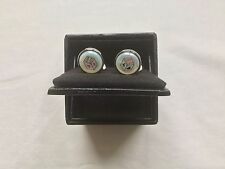 Vintage mother of pearl cufflinks in original box. Race horse design. Dispatched with Royal Mail 2nd Class. vintage mother of pearl cufflinks. Ovals 2cm long, buttons 1cm diam. no defects. Very suave set of cufflinks by Ted Baker. If other options are available, they are listed. Mens Ted Baker Cufflinks ×2 BOGO!! I n g o o d u s e d c o n d i t i o n.
Black Lip Mother-of-Pearl Cufflinks, oval shape, Gold Plated. Oval gold-plated Cufflinks with Black Lip Mother-of-Pearl stone. The cufflinks are presented in a black velvet drawstring pouch. These cufflinks would be a lovely gift for any well-dressed gentleman! Vintage Mens Mother Of Pearl Tiepin & Cufflinks Set in Original red shell shaped Box, by Stratton of England. Condition is Very good except for mark on bottom of case ( see last photo ) Dispatched with Royal Mail 2nd Class. (One of these has 21mm. torpedo shapes at both ends . ,the other cufflink has 25mm. torpedo shape one end & a 13mm. round, the other is 7mm. square).they have 11mm/12mm. 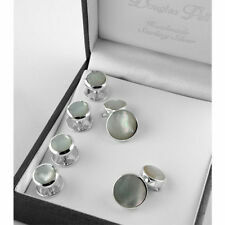 4 x ‘Mother-of-Pearl’ detachable Buttons: (13mm dia.). Clean and a polish . 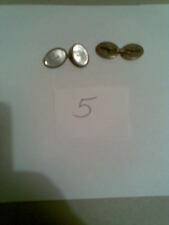 Here for sale we have a nice cufflinks in good order. Golden History Limited. They are a smart fluted shape. There is rubbing to the goldtone plating on the shanks of the cufflinks. Mother of Pearl Effect. Lovely Pair. Good Luck! Due To Age & Use. Has Slight Wear To Edge of One Cufflink. Pair of Sterling silver, onyx and mother-of-pearl cufflinks of chequerboard design, with hanged bar back links, stamped 925 for sterling silver. In good order. Has mother of pearl Chinese characters. Measures 23mm x 12.5mm and weighs 7g. Unsure of exact age, but believe they are pre-1940's. 1.5cm long. In presentation box (not original). 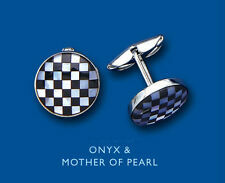 Lovely pair of cuff links with m.o.p and onyx front. Marked on the back Lambournes Birmingham. 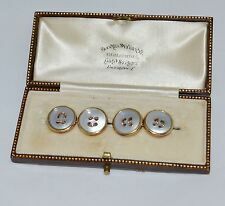 A set of cufflinks and tie pin with mother of pearl, or similar, in original box from H.Samuel. The barrels are marked 'TENAX REG'd' and 'ROLLED GOLD'. Pre-worn and with scuffs and signs of wear. The gold is wearing thin. 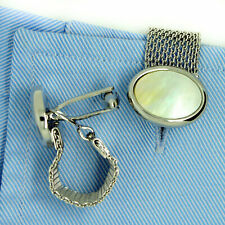 Circular Silver Mother Of Pearl Cufflinks sent in a velvet bag. Lovely pair of Kigu of London cufflinks. These are little cowboy guns and the handles have real Mother of Pearl on them. Great for the line dancing fan or the cowboy.